Drawing 1173 uses the west elevation of the Krematorium intended for the Auschwitz main camp (drawing 935, reused in the combined elevation drawing 936). The date of 15th January 1942 corresponds to this older drawing, NOT to the new number allocated by the Bauleitung, 1173, which according to comparison with others drawings must have been issued in April 1942. 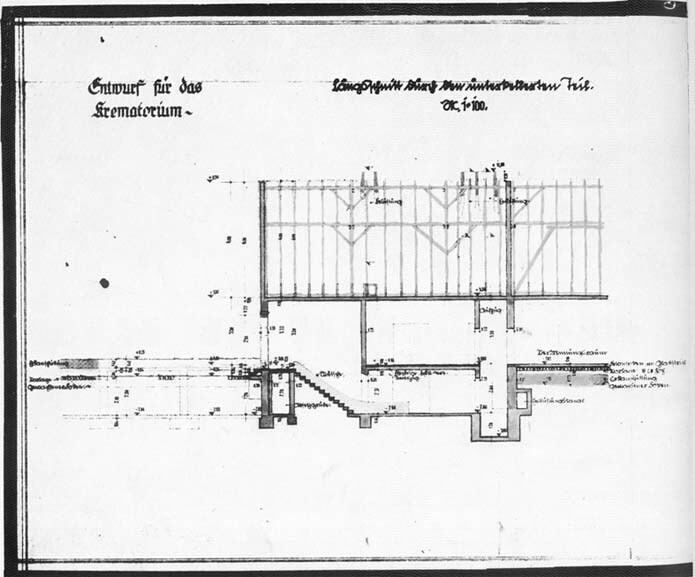 Drawing 1173 shows the cross section of Leichenkeller 1 (the future gas chamber) where it joins the ground floor of the building, and shows in detail the paths of the ventilation and air extraction ducts. The transformation of this room into a homicidal gas chamber did not bring about any modification in the ventilation system, which had been designed for an underground morgue. The idea was that fresh air coming in [Belüftung] near the ceiling would cool and descend to the lower layers and be taken out near floor level through the air extraction ducts [Entlüftung]. If the system had been designed in the first place for a gas chamber using hydrocyanic acid, it would have been reversed with respect to that drawn, with the fresh air coming in below and the warm, toxic air being extracted from above. This cross-section, contrary to what historians have hitherto claimed, cannot be used to prove the existence of a homicidal gas chamber in Leichenkeller 1 of Krematorium II. Unlike on drawings 923 and 934. the transverse connection of the fresh air inlet duct is not covered with earth. Drawing 1174, drawn like 1173 in April 1942, shows the shape of the corpse chute designed to serve the at first three, then two underground morgues of Krematorium II (Leichenkeller 1 and 2), and, in the roof space, the various ventilation chimneys, the single chimney on the left being the fresh aid intake for Leichenkeller 1, and one of the two on the right being the noxious air outlet for Leichenkeller 1 while the other is the air outlet for either Leichenkeller 2 or the furnace room. The discrepancy between the numbers of this drawing and its date is an indication that the members of the Bauleitung, who had completed the study for the new Krematorium at the main camp only on 28th January 1942, with a complete series of drawings (932, 933, 934, 935, 936, 937, 938), had been caught unprepared by the decision made on 27th February 1942 to transfer the building to Birkenau where the nature of the land was different. Pushed for time, they used the drawings from their earlier study, making the absolute minimum of changes and not even bothering to change the dates and some of the numbers on the original identification blocks.